Druid Central | Where's my backpack? 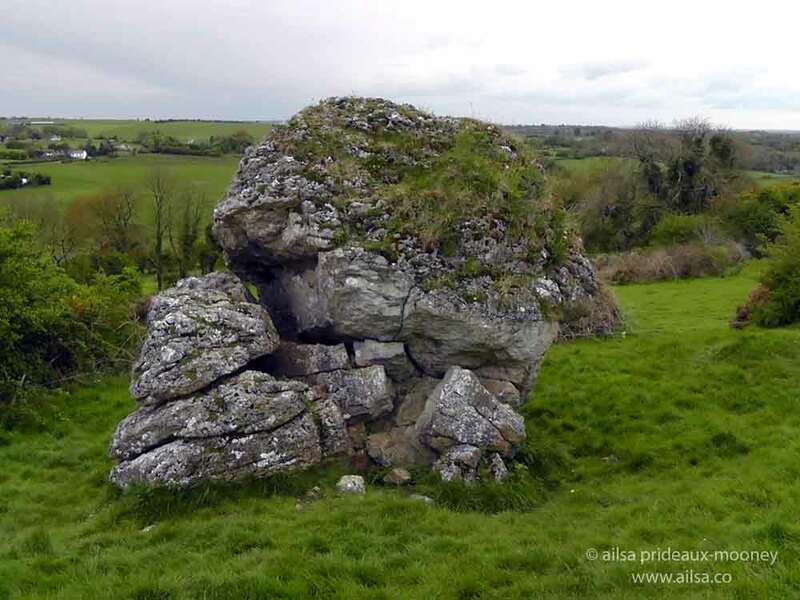 While I was attending the Bealtaine Fire Festival at the Hill of Uisneach last month, I took the opportunity to explore several of the ancient monuments and earthworks dotted around the 2 square kilometer large site. The most captivating feature is a large glacial erratic located in a circular enclosure. Composed of limestone, it stands almost 20 feet tall, is estimated to weigh over 30 tonnes and has been nicknamed the Cat Stone, for from some angles it resembles a sleeping cat. It goes by other names too – Umbilicus Hinerniae, Axis Mundi, Ail na Míreann (stone of the divisions) and the navel of Ireland. It marks the point where all four of Ireland’s provinces meet, was believed to be a gateway to the mystical fifth province Mide and the goddess Ériu, who gave Ireland its name, is allegedly buried beneath the Cat Stone. Ancient druids believed the Cat Stone marked the absolute centre of Ireland. With today’s GPS technology the exact centre of Ireland has been located just over 18 miles west, in a townland called Carnagh East on the shores of Lough Ree but even so, I am going to have to doff my cap to those druids. Only 18 miles out with no satellite technology, maps or aerial surveys? That’s pretty good going in my books. On the same subject, I discovered a tongue in cheek documentary from an old Irish tv programme called Hall’s Pictorial Weekly, from back in the days when Irish telly only came in black and white. They visited several sites claiming to be the dead centre of Ireland. This entry was posted in Europe, Ireland, Photography, Travel and tagged history, inspiration, nature, photography, photos, pictures, travel, writing. Bookmark the permalink. It may have been the exact center in ancient times. How do we know that the coastlines haven’t shifted since then, which could change the center location….You are right, even if the Druids were 18 miles off, that’s still an awesome geographical/mathematical feat. Great piece of footage! My father used to film for Hall’s Pictorial Weekly when I was a kid. How much fun, Melissa, those guys were definitely ahead of their time with their political satire. Thanks for introducing me to this — have never heard of this Cat Stone. Very interesting… and the video is brilliant! I had a good laugh watching it, I love how almost everyone is wearing a tie, even out in the middle of a big old field. Ahh the good old days. I am so intrigued with Ireland. It seems so magical. And you are so right, that is pretty darn close for those days! Great post. Thanks for making this post! I love the idea of the center of Ireland being marked by a naval. How did it “feel” while you were there. Did you feel the energy? As far as the druids getting it close. I am with you. With no technology it is amazing what they got done!